MERIDEN - Throughout the first couple weeks of the season, the Newington football team was on the hunt to find its identity. Now the Indians are nearing the end of the season and have finally found what they were looking for on Thursday evening during their 43-20 loss to Maloney (7-1). The Indians are known to have a tough schedule that features some of the top teams in the state, such as Middletown, Maloney, East Hartford and Wethersfield. 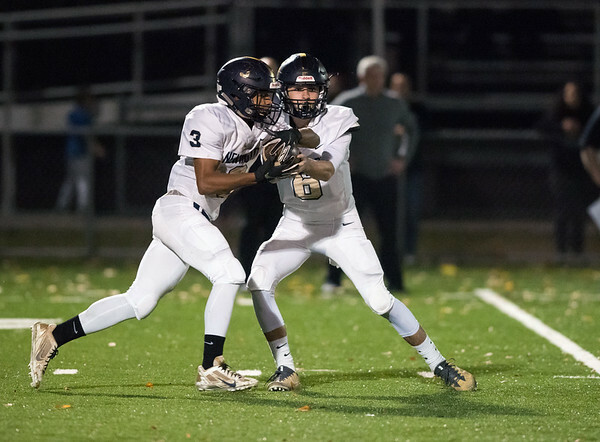 Newington has had two shutouts so far, a 38-0 loss to Platt and a 42-0 defeat to unbeaten Middletown last week. Newington was hit with adversity as soon as the game began. Newington quarterback Nick Pestrichello’s pass to receiver Izayah Ciarcia was picked off on the second play of the game, turning the ball over the Maloney. The Spartans then used that momentum to score a 28-yard rushing TD. But that didn’t affect the Indians. In his first game back since being concussed, Pestrichello connected on 11 of his 20 attempts for 74 yards with two touchdowns and one interception. The Indians’ offense was clicking on both sides of the ball, something they were unable to do in previous games. Running back Dylan Nees-fair had 21 carries for 51 yards, while Ciarcia was 5-16 and Pestrichello had 3-10. No matter how many times the Spartans scored on the Indians, they were still in the game. Newington scored twice more in the second half. The first came near the end of the third quarter on a 15-yard pass from Pestrichello to Ciarcia and the second came with less than six minutes left in the game, on another pass, a 25-yarder, from Pestrichello, but this time to receiver and kicker Gunnar Johnson. But, despite the improvements that were made, there’s is still plenty of work to be done. And although the Indians were competitive on Thursday, Pace is always looking for more. Posted in New Britain Herald, Newington on Friday, 2 November 2018 21:39. Updated: Friday, 2 November 2018 21:41.